My name is Dom, and I’m primarily an EDH and Draft player. I played Magic on and off since the original Mirrodin block up until Lorwyn, but then took a long break until I came back for good right before Theros. My favorite aspect of the game is brewing, and I think that is why EDH has become one of my favorite formats. There’s nothing better than sitting down and playing a deck for the first time and watching the work you put into building the deck come together. This series focuses mostly on artifacts and enchantments, particularly ones that are typically described as ‘build arounds’ and that require a fair amount of work in order to maximize their potential. I will discuss strategy, deck building guidelines, and which commanders pair best with the cards in question. This inaugural article discusses a personal favorite artifact of mine, Birthing Pod. 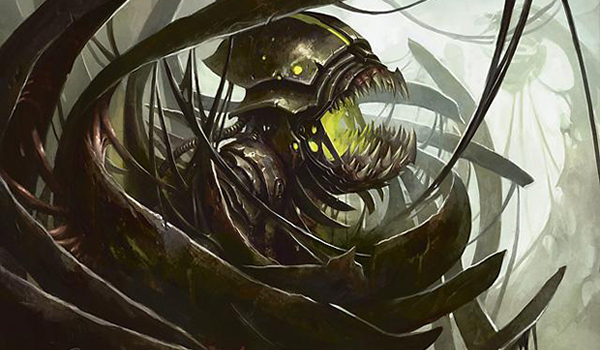 A quick search on EDHREC shows that Birthing Pod is currently used in over 5,000 decks, putting it as the sixth most popular card from the entire New Phyrexia set. That’s quite an accomplishment, considering this is the set that gave us the Praetor cycle, the Chancellor cycle, an incredible array of powerful equipment, and, of course, many truly busted cards featuring the Phyrexian mana symbol. 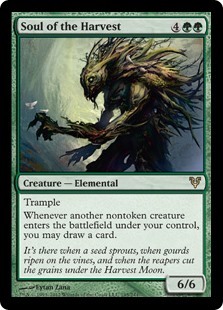 Birthing Pod (or just Pod, for short) is a green creature tutor that allows its user to take a creature from their deck and put it directly into play; and it can do this every turn. 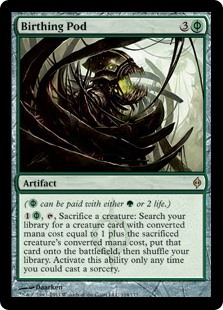 The only caveat is you must sacrifice a creature in play in order to search, and the creature you look for must have a converted mana cost of exactly one more than the sacrificed creature. Despite this seemingly strict limitation, Pod still manages to be a card that quickly demands an answer, providing the deck is properly built to utilize it. A great deal of Pod’s power comes from its ability to grab specific answers; assuming the answer is in your deck. Need to deal with a problematic enchantment? 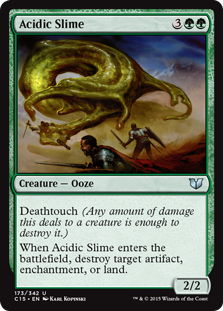 Go get Acidic Slime. Are your opponents trying to fill up their graveyards? Search out Scavenging Ooze and start exiling. Perhaps the table’s voltron player is suddenly looking too strong? Find your Fleshbag Marauder before it’s too late! Pod can also advance your game plan by searching out the appropriate creatures to execute your strategy. 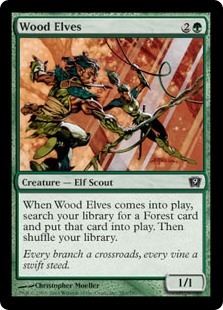 It is child’s play to find ramp creatures like Wood Elves which can quickly help you build your mana base. Creatures with card draw bolted on can be found too such as Mulldrifter or Disciple of Bolas. 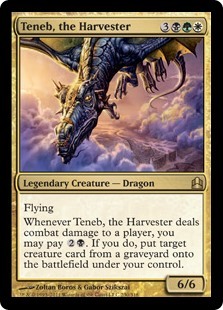 One of Pod’s most useful abilities is grabbing win conditions such as combo enablers like Mikaeus, the Unhallowed or Deadeye Navigator to finishers like Craterhoof Behemoth or Avenger of Zendikar. Below is an overview of the creatures most commonly played in decks with Pod according to its EDHREC entry as of this writing. According to EDHREC, this list is a good representation of the many uses Pod sees across EDH decks. There are many creatures throughout Magic’s history with useful effects bolted onto them, and this is just a small sample of the possibilities. A good number of these creatures, such as Grim Haruspex, Butcher of Malakir, and Blood Artist provide extra value out of your sacrifices when activating the Pod. As you’ll see in a moment, this synergy leads to Pod being a common inclusion among black and green decks with a sacrifice theme. While this list contains many useful cards for Pod decks, let’s consider some cards that I was shocked to see apparently aren’t played as frequently. 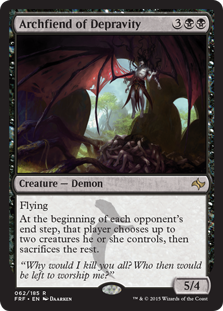 Archfiend of Depravity is a devastating card that single-handedly ruins token strategies while leaving your board intact. Another pair of cards that should go in many Pod decks are Soul of the Harvest and Garruk’s Packleader. 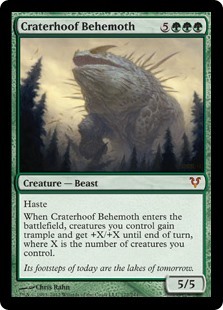 Both creatures provide enormous card advantage in the creature-heavy decks where Pod is typically played. Birthing Pod decks have one solemn rule that must be obeyed: always pay attention to your curve. Your curve must have both fodder and targets for Pod spread across multiple costs so you can get what you need when you need it. This helps make your deck more consistent while keeping Pod versatile. 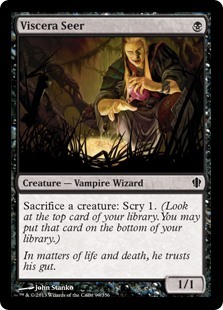 For example, my own Mazirek, Kraul Death Priest deck (which I’ll be showing off shortly) has several creature-based sacrifice outlets, such as Viscera Seer, Bloodthrone Vampire, Bloodflow Connoisseur, Dimir House Guard*, and Sadistic Hypnotist. These creatures fill every slot in my curve from one to five, making them much easier to Pod regardless of what creatures I have in play. *Dimir House Guard pulls double duty in this deck as a way to tutor for Pod as well!!! With all of this in mind, I’d next like to discuss which commanders suit Birthing Pod the best. 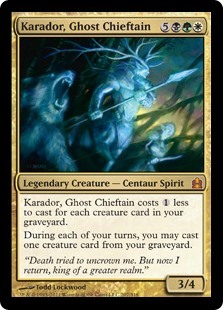 According to EDHREC, the two most popular commanders that feature Pod are Meren of Clan Nel Toth and Karador, Ghost Chieftain. These two are undisputedly the most common users of Pod, with over 800 Meren decks and over 500 Karador decks. Upon closer inspection, over 61% of Karador decks include Pod with Meren a close second at 59%. Beyond this, the statistics start to become a less clear cut. While Derevi, Empyrial Tactician, Roon of the Hidden Realm, and Animar, Soul of Elements show up as the 3rd through 5th most common users of Pod with over 200 decks each, Pod itself only shows up between 20% and 30% of the time in those decks. Since all three of those popular commanders are from Commander pre-constructed decks that are chock full of good creatures, it’s not surprising that Pod shows up as often as it does. However, after a little bit of digging around on EDHREC, I discovered four very different commanders that include Pod at much higher rates, despite having fewer decks overall. 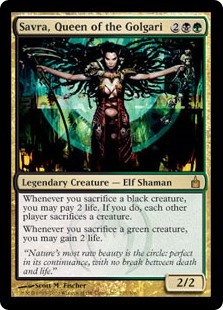 These commanders are Yasova Dragonclaw (45% run Pod), Savra, Queen of the Golgari (43%), Yisan, the Wanderer Bard (42%) and Mazirek, Kraul Death Priest (37%). These commanders have much more to gain from including Pod in their builds. 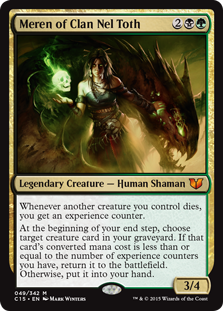 If you’re interested in a Golgari deck with Pod that’s more focused on sacrificing your creatures than bringing them back to life, Savra and Mazirek are two commanders that are definitely worth a look. Both have powerful abilities that trigger anytime you sacrifice one of your own creatures. In addition, these decks often play edict-effect cards like Grave Pact, Harvester of Souls, and Pawn of Ulamog that create additional effects anytime a creature you control dies. In decks like these, Pod’s sacrifice ability becomes just as valuable as the tutor half, while letting you grab new creatures for future sacrifice. 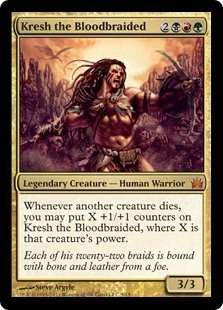 This strategy also works well in Kresh the Bloodbraided decks, who surprisingly only runs Birthing Pod 29% of the time. This seems like an oversight, as Pod could be used in these decks to grab edict effects like Merciless Executioner or cards that pump up Kresh’s power like Xenagos, God of Revels, all while giving Kresh additional +1/+1 counters. 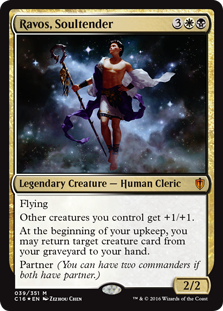 Finally we have two commanders with play styles all their own that can make great use of Birthing Pod, Yasova and Yisan. 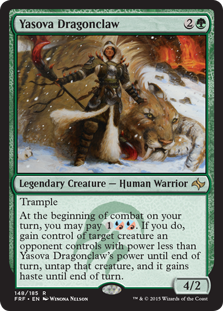 Yasova is an interesting commander who has the ability to steal one of your opponent’s creatures each turn. Birthing Pod fills a niche role in this deck as one of the best available sacrifice outlets for the Temur clan, letting you sacrifice the stolen creature to grab something of your own. Much like Animar as mentioned above, Yasova decks are capable of running plenty of great tutor targets due to the color combination the deck falls in, including some powerful blue creatures like Kiora’s Follower (which untaps Pod) and Prime Speaker Zegana. 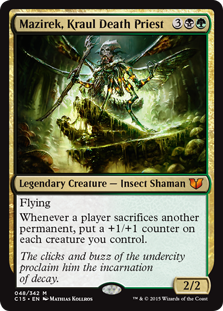 Yisan on the other hand uses Pod simply as a way to get more creatures onto the battlefield. 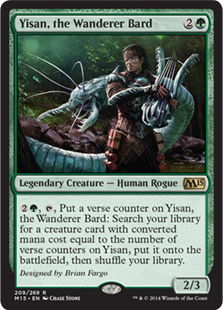 What sets Yisan apart from other creature-centered commanders is the way Yisan’s ability works, it’s a lot more common to have a board presence containing multiple creatures of various mana costs. As a result, Pod becomes a much more consistent tutor. Before we finish up this week’s article, I’d like to talk about one more card, not a creature or a commander, but an enchantment from the recently released set Aether Revolt, that I imagine will quickly find its way into plenty of Birthing Pod decks. That card is Aid from the Cowl. 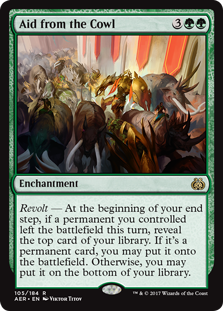 Revolt is an interesting ability in EDH, but Pod is an easy way to trigger it every turn. Not only that, but the kinds of creature-heavy decks that Pod is good in also happen to be a great fit for the Aid. Together this pair provide consistent opportunities to put a free permanent into play each turn, on top of the tutoring from Pod. I haven’t tried it yet myself, put I’m very excited to see these two cards come together. Birthing Pod is an incredibly powerful and versatile tool so I want to leave you with my own Mazirek, Kraul Death Priest decklist that features Pod in full force. Pod has many uses in this deck, helping me grab token creators like Mycoloth and Avenger of Zendikar, additional sacrifice outlets like Sadistic Hypnotist, and cards that give my giant army a way to push damage through like Pathbreaker Ibex. As a forewarning, this list is slightly budget so be forewarned that I excluded some normally great options like Craterhoof Behemoth, Phyrexian Altar, and Grave Pact. Still, the deck manages to be quite ruthless due to the undeniable power Pod provides. If you have found any unique uses for Pod that I didn’t talk about here, let me know! I’d also love to see your own takes on EDH decks with Pod! You can find me on Twitter @DomSaccento. Dom is a Magic player from Northern New Jersey. His favorite formats are Commander and Draft. When he's not playing or reading about Magic he can be found concert-going or cooking.